Along Stapleton road, on the sidewalk underneath the M32 Underpass, next to the skatepark in Lower Eastville. 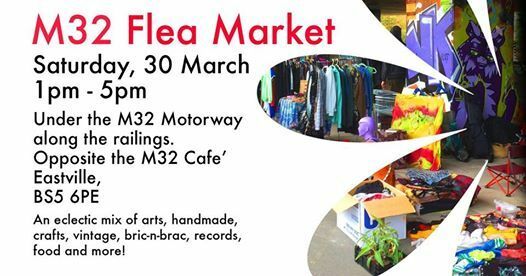 Directly opposite the M32 Cafe. Please let us know what you plan to sell. - For food and beverages: you would need to obtain food hygiene certificates. - Please get there from 12:00pm. - The stalls are all marked out and you are free to set up where you would like. - We will be on hand to help. - Fee will be collected when everyone has set up. - Bring your own sheet or cloth/blanket, or table and chairs for set up. The stalls are approx. 3mx2m. - Drop-off: On Napier Road, BS5 6NX. We have trolleys available. - If you need to come with transport, best to park in New Stadium Road, opposite Ikea or surrounding in Stapleton Road. Note: This is a family friendly community event. Please consider neighbours, visiting families and other stall holders. We also ask you to keep the space clean and dispose of any rubbish in the recycling bins provided. Also take all your stuff back with you, we do not have the capacity to dispose of bulky items. Take the slip road into Stapleton Road. The market takes places underneath the overpass next to the railings. If you are WALKING / Cycling from Easton. Take Stapleton Road towards Eastville Park/ Muller Road Roundabout. The market will be before you hit the Muller Road Roundabout on your left. From the Ikea Car Park, cross over the river to the left, walk under the underpass, and follow the railings. Go beyond the skatepark. We will be right there. Bus no. 24 stops directly opposite the space from Southmead. 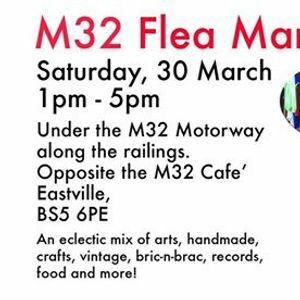 If you travel from Town: take any bus to Eastville Park, or Stapleton Road and walk from there. And if you take the rail! Stapleton Road Station is just 5 minutes away! Please share this market widely!